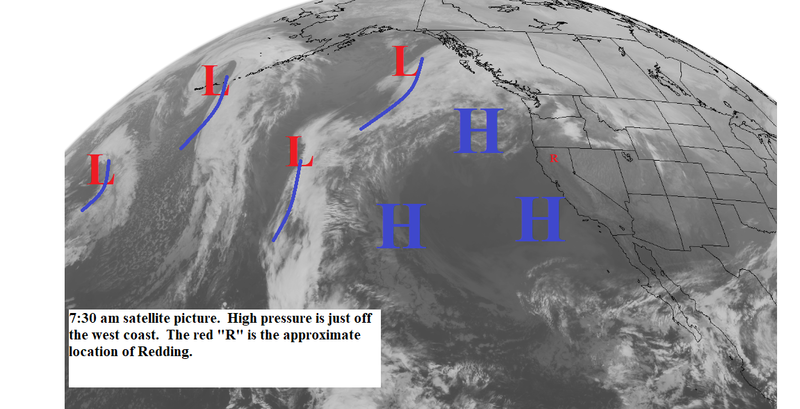 The high pressure ridge just off the coast continues to block frontal systems from reaching our area. Today through Saturday we will see mostly sunny skies with daytime temperatures 15 to 20 degrees above normal. Light to moderate north winds will continue. Skies continue clear next week. Temperatures will cool a little as low pressure area drops from Canada into the Central U.S. (see map below), and pulls a little cooler air into Northern California. Strong and gusty north to northeast winds will occur Sunday through Tuesday. Longer range forecast maps show the ridge holding at least through the 20th.